God, what a scrawny bunch we were back then! 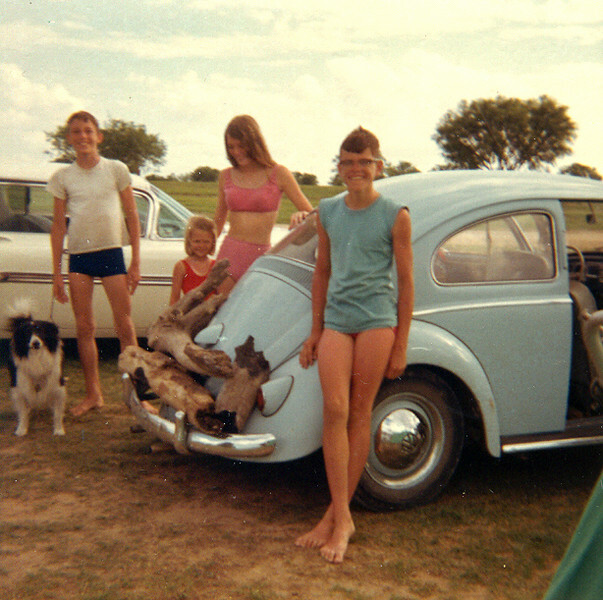 Here we are, seen here with the two family cars of ours, the white 1959 Chevrolet Impala and Dad's "new" blue 1958 VW Beetle (note the Euro turn signals on the door post). I learned to drive in that car, just ask my sister, Lyn. What a wild ride I gave her that first time I got behind the wheel. She didn't know I'd never actually driven before. L to R: Bolivar (Uncle Linuel's border collie), Carl, Stacey, Carol, and me.